Discussion in 'Weather' started by Sandy, Nov 19, 2018. Its a completely different headspace. Its pretty rare for a rain event to not deliver snow as it passes to the south, pushing away to the noreast. Fancy_Pants, oldgeezer and Chowder11 like this. Conditions held nicely today for a tour up to summit of Maeyama, sun poked its head out for awhile and the winds stayed away, nice powder below 1600, little wind affected above that but really nice conditions. Jellybeans1000, Olgreg, Tanuki and 1 other person like this. Yeah I also saw this and was slightly disappointed, I was really hoping that we'd get some daily top ups over the day/night. I think these forecasts don't really take into account orographic snow, I just don't know whether the wind is blowing in the right direction/sufficient velocity to generate some bonus snow and was hoping someone more knowledgable could provide some insight into the microclimate around Niseko/Kiroro/Rusutsu. I've also seen this forecast which seem slightly more bullish, let keep our fingers crossed! Same - however I am heading to Furano with day trips to Kamui and Asahidake. EC is better than GFS remember? Mind you . If I was flexible..and wanted pow. I'm on holidays in Nagano next week and I'm just hoping that there isn't rain on my parade! We arrive at Shiga Kogen next Monday, staying at Prince West 1550M. Hopefully the elevation will be our friend. Epic day at Seki today with 50cm overnight and another 18cm during the day, just snowed all day and stayed cold with negligible wind. Perfect powder day, waste deep in the trees on the lee aspects. hotsaki and Guthega Girl like this. It probably owes to the fact there is no free precipitation charts for EC. People don't really love thickness charts. It probably owes to the fact there is no precipitation charts for EC. People don't really love thickness charts. 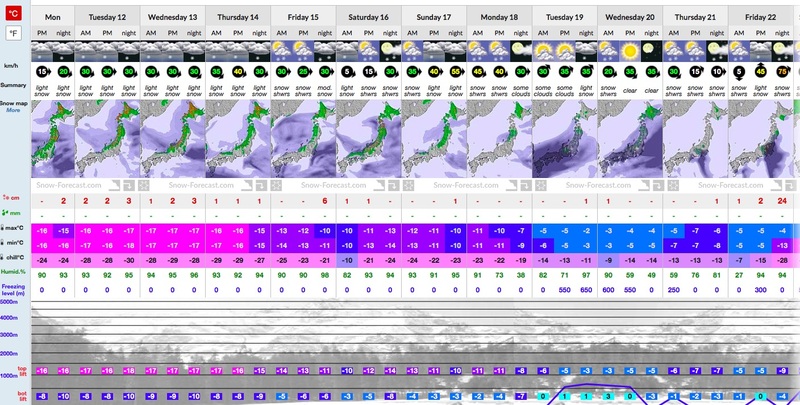 Saturday doesn't look bad for the higher mountains on Honshu, and Sunday night should be good. ATM as stated Wednesday looks to be a washout, with some snow in the backend. GFS has had some sort of disturbance in the region for a while for Weds. The thing to watch is the weak highs, practically perfect territory for lows to come up to Japan, with there still being a gradient. Do you mean further out in the timeline or further out geographically? I see what you mean now I look at it though. Sunday (24th) now looking more than a little disgusting on GFS. That's a long way off yet though! Don't look at snowforecast. IMO for Japan. Buzza8 and Chowder11 like this. What date you looking at? I was looking at Wednesday but just RE read your message and apologies it’s next Wednesday ( we fly home Tuesday unfortunately) do you think the freeze level will change Sunday for snow to fall in Furano instead of rain ? Maybe hit higher mountain like Asahidake. Thoughts ? Buzza8 and gaz35 like this. The likelihood of rain means I might br taking two pairs of pants for just five days on the slush. Might only be four days if Wednesday is to be a washout as in that case we'd probably use the last unallocated day on the JR East pass to go down to Matsumoto for tourist stuff at the castle and art gallery. Crazy day at Arai today with a good 50cm of overnight snow in the gullies, crazy deep in sections, visibility was minimal, but the forgiving snow well compensated, snowed all day non stop at least 10-15cm extra at the car at 3pm . A day for good low light lenses, and sticking to known terrain or the sparse trees. Tanuki and Olgreg like this. Hakuba area? What’s ya thoughts on the models you posted? Very spring like for Hakuba. I don't see much cold smoke.